Raffi singing "Apples and Bananas" was a staple of my childhood, as it was for many a fellow youth services provider. I've found that this quintessential millennial's song remains popular with todays young kiddos, too--they love the silliness and catch on to the repetitiveness, making it a great singalong for storytime groups. I played around with a few ways to accompany the words with the ukulele, and this is the version I like best. 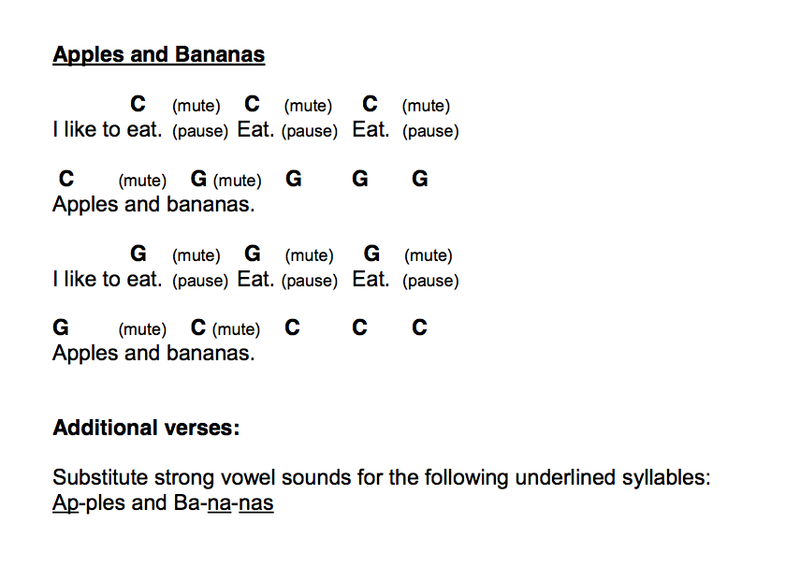 Now go sing about fruit! My, my, my, am I into repurposing falling apart books lately. My latest endeavor in reusing withdrawal fodder is meant to provide diversion for the kiddos stuck with their parents at the public computers. As I've mentioned before, our public internet computers are not in immediate proximity to the children's area. Which means, if a caregiver wants to use the computers and there's no one to attend to the child/ren in the children's area, the kids have to stay in the computer area. As I've also mentioned before, we aim to do what we can to keep these young customers engaged and happy while they wait for their grownups. We've got coloring books and crayons, portable toys, quick reading material... And, now, stand-along Where's Waldo sheets. You see, I had a Where's Waldo book that was falling apart. While the binding was shot, many of the pages were just fine. So I spent a few minutes locating Waldo on the pages that were in good shape, then cut those pages right out of the (now withdrawn) book. 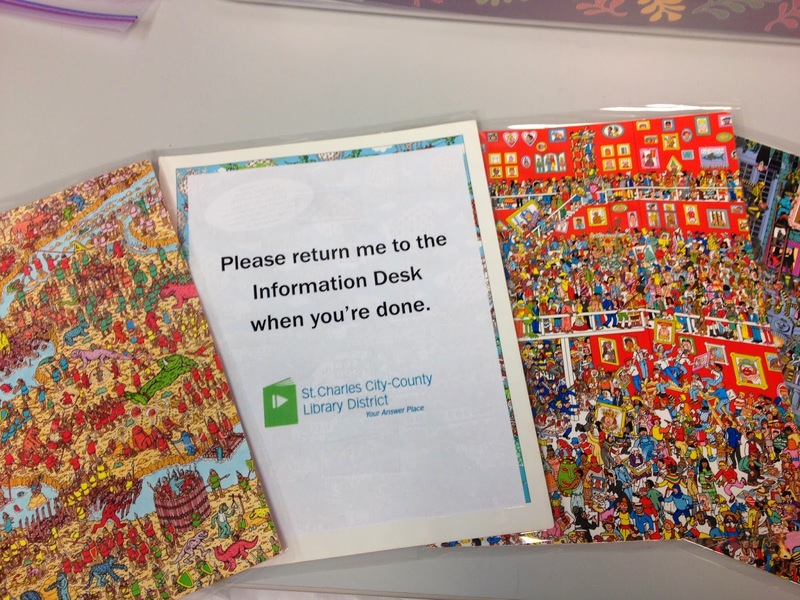 I printed up some sheets with the library logo and the request to return the pages to the information desk when the quest for Waldo was complete. Then, when I was visiting the cataloguing department to laminate the pages for our second annual Picture Book Walk, I laminated these standalone Waldo activity sheets, too. Now the sheets are at the information desk, and I anticipate them getting plenty of use this summer when the days are hot and the computer bays are packed. And who knows! Maybe I'll stumble upon something else to repurpose soon. Do you ever repurpose library materials that are falling apart? Tell me how! What are you doing at #alaac14? Come to a Guerrilla Storytime! Exactly one month from today, I'll be one of those library folks headed to Las Vegas for the 2014 ALA Annual Conference. There's lots to look forward to at this conference, from the 2014 Newbery celebrations, to the program sessions, to the publisher events, to the presentations. And that's not even taking into account the flashy bonus that is Las Vegas itself. One of the things I'm most excited about, however, is Guerrilla Storytime. Guerrilla Storytime made its debut at the 2013 ALA Annual Conference in Chicago, and since then, it's become something of a training and advocacy phenomenon. And so, obviously, it must take place with even more energy this year, on its first anniversary! 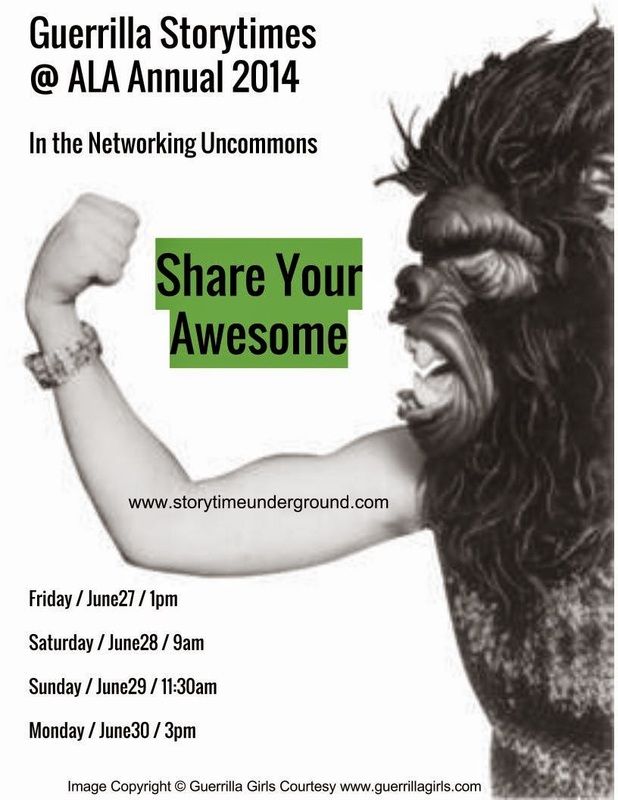 Friday, June 27 @ 1 p.m.
Saturday, June 28 @ 9 a.m.
Sunday, June 29 @ 11:30 a.m.
Monday, June 30 @ 3 p.m.
All Guerrilla Storytimes will take place in the Networking Uncommons space at the convention center, and everyone--EVERYONE!--is welcome to attend. Participation optional! Note: Because we like to share what happens at Guerrilla Storytimes with the Storytime Underground community at large, we would love to have some folks volunteer to take notes, pictures, and/or videos of the Guerrilla Storytimes they attend. The more we crowd-source the recording of these training and advocacy events, the more benefit they can provide. If you're interested, let us know on the Storytime Underground Facebook group! I have been thoroughly enjoying myself with my 2014 challenge to make monthly felt stories and activities for my storytimes. In fact, I'll find myself at work, flipping through picture books, and suddenly I'll see how a story might translate to a felt version. I must say, that's not something that ever just popped into my head before. I was particularly surprised, then, when I woke up one day on my morning off thinking, "I'm going to make finger puppets today!" And, reader, that's what I did. Since lots of my storytimes are outreach events for classrooms of up to 60 preschoolers, I chose the story of The Little Red Hen for my puppets. The story is repetitive, which I find works well with groups, and because the characters are all different animals, I knew the finger puppets would still be easily differentiable from the back of the storytime room. I created my own freehand patterns for these puppets, although I spent about 20 minutes on Pinterest looking at what other folks have done for hen, cow, pig, and cat finger puppets--I wanted to get a sense of how I thought my puppets might best look. After hand-drawing my pattern, I used felt, embroidery floss, some small buttons, and puffy paint to get the final products. These puppets have been making the outreach storytime rounds with me, much to the delight of many a local preschooler. Finger puppets, accomplished! 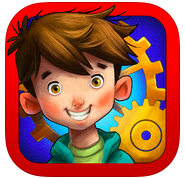 Have you been looking for some new ways to paint with your library kiddos? 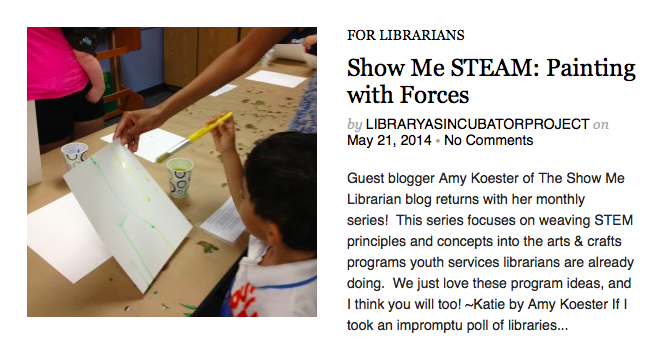 Then head over to The Library as Incubator Project, where my post today deals with painting with forces. Help your painters get creative with the help of gravity and magnetism! Head over to LAIP to get full details on how to paint using these fundamental forces. Darien's done it. Michigan's done it. And now, we're doing it here in the Midwest in Missouri, too. That's right, folks. We're Unconferencing. Have you ever wanted to attend a conference where all of the breakout sessions were exactly the ones you wanted to attend the most? Now you can! Register for the inaugural Midwest Youth Services Unconference and join us for a FREE day of training and networking for all children’s and teen library staff! The first Midwest Youth Services Unconference will take place on Wednesday, August 20, 2014, at the Spencer Road Branch of the St. Charles City-County Library District in St. Peters, Missouri. From 9 a.m. to 4 p.m. that day, youth services library staff will meet for a day of customized professional development sessions that meet your personal needs and interests. You can register for the Midwest Youth Services Unconference here. What’s an Unconference? An Unconference is a particular type of professional development that is designed to meet the training needs of everyone in attendance. The breakout sessions are chosen by attendees at the beginning of the Unconference day, and the chosen sessions will be led and/or facilitated by attendees who volunteer in advance. For example, if attendees want sessions on makerspaces, dynamic storytimes, and simple teen programs, those are the sessions that will be offered at the Unconference. Mark your calendars, friends! I look forward to seeing you in August for the first Midwest Youth Services Unconference. My last few takeaways from the 2014 School Library Journal Public Library Leadership Think Tank in Nashville came from a presentation by Denise Lyons. While Lyons had lots of interesting things to say about her topic--connecting to broad strategic development--the two points from her talk that hit home most to me really come down to staff empowerment. Admittedly, staff empowerment and empowering youth services folks in particular is on my mind a lot these days, what with the whole M.O. of the Storytime Underground. Thus the impact these two statements have had on me. First, there's a way to move away from the most common roadblock in implementing a new service: "We tried that and it didn't work." That statement forces staff to slam on the brakes, taking away agency from people moving forward with ideas--ideas which, in all likelihood, they've given a fair amount of thought and research. BUT, says Lyons, you can restructure that negative shutdown by empowering the staff members who make the seemingly idea-ended statement. Get the staffers focused on a historical lack of success on the team of people who are figuring out how to launch the new iteration. They'll be able to bring their perspectives of what went wrong to the discussion, simultaneously letting them feel listened to and allowing the project team to take into account and make plans for historical problem points in order to avoid or address them this time around. Empowering! The other big empowerment takeaway is most excellent: to get staff to do micro trainings, which Lyons called "Mini TED Talks." The argument is that staff don't need hours of trainer certification and experience at conferences in order to talk for 10 minutes about that thing they're really knowledgeable about. If a staffer is good at something and hearing about it would positively impact the work of other staffers, create a platform for micro trainings where that expertise sharing can take place. (That's basically the entire methodology behind guerrilla-style trainings anyway; a rose by any other name and all that jazz.) I've made no secret of my desire to see more folks speaking up about and sharing the excellent work they do, both for personal empowerment, advocacy, and the sharing of best practices that can result. Hearing that call for expertise sharing from another forum makes me very, very happy. That wraps up my recaps of the 2014 SLJ Think Tank. I had an excellent time attending the conference, and I very much look forward to the conversations that will continue and develop out of the ideas that were shared in Nashville! It's fair to say that I am not crazy about decorating in the library. In fact, I'm pretty much anti-decorating. At the very least it costs time, then oftentimes you add in craft supplies or purchased decorations, and pretty soon you have something else in the library that'll collect dust and/or look dated when you forget to take it down in time. I'd much rather put my time and effort into appealing materials displays than decorating. You know those uber-popular kids books that are so heavy their bindings break much too quickly? Think Star Wars character guides and Disney storybook collections. They always have a high damage rate, as the many thick pages stress the binding. I've been replacing a lot of these titles recently, but instead of just withdrawing and recycling the pages of the fallen-apart copies, I saved them. And I made decorations for the library. Recycled Book Bunting in all its colorful, draped glory! A close-up of the bunting. I made a triangle template out of cardstock and cut out recognizable characters from the pages of these books: Mickey Mouse, Nemo, Mulan, Bambi, C-3PO, Yoda, Princess Leia, etc. I also made triangles out of bright blue and green, our library's colors, and strung all the little flags up on some purple string to make bunting. Our maintenance staffer hung them Monday morning, and I must say I'm pleased with the results. So, despite my being someone who generally abhors decorating, apparently I think it's a grand idea when it repurposes illustrated books that have met an untimely demise. By turning the recognizable illustrations into colorful bunting, we're getting more bang for our buck out of these titles. And now I'll go back to my general "our decor is fine how it is" M.O. 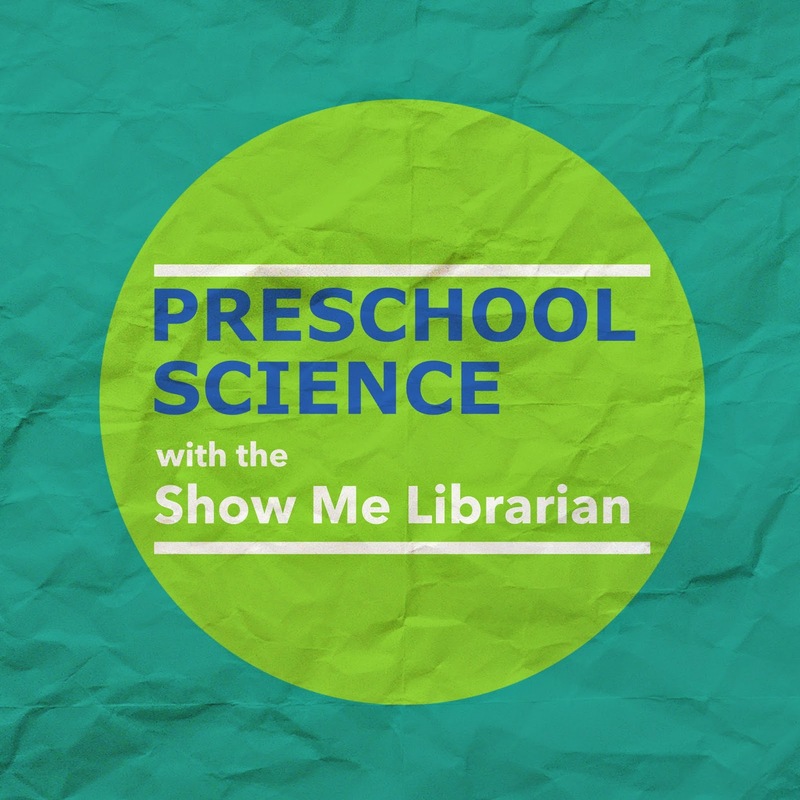 I'm over on the ALSC Blog today sharing a facet of each of my Preschool Science programs: the take-home activity handout. I make these handouts, which extend the learning on our science topic from our program, available at the end of each Preschool Science program. At least half of the emails I receive about my ALSC Blog posts are requests to see these handouts, so I figured it was high time I shared some demos. Head over to the ALSC Blog to get a glimpse of several of my handouts! Today marks the first time I'm participating in Common Core IRL (In Real Libraries), a blog hop featuring outstanding librarians and bloggers Mary Ann Scheuer at Great Kids Books, Alyson Beecher at Kit Lit Frenzy, and Cathy Potter and Louise Capizzo at The Nonfiction Detectives. I'm joining the ranks to add an additional perspective to what the Common Core State Standards look like in real libraries. I should say that the Common Core State Standards are controversial here in Missouri, and it's unclear how much longer they'll be part of the state curriculum. 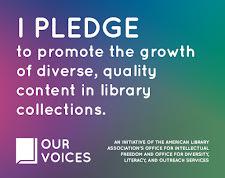 Many of the principles within the CCSS, however, remain excellent for thinking about sharing excellent books--especially non-fiction--with young readers, so I have no qualms about continuing to use the CCSS as a lens to think about the readers' advisory I do in my public librarian job. No matter how contentious CCSS may get here in Missouri, baseball is a staple. 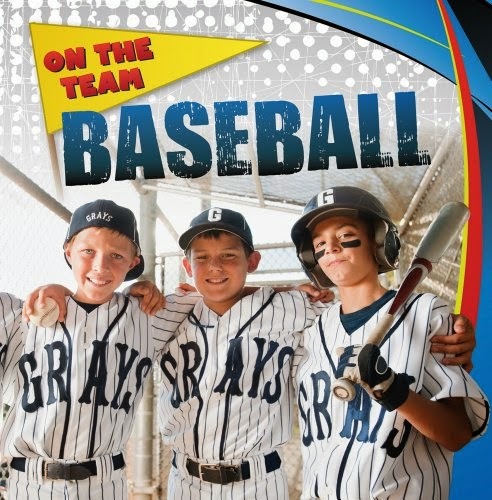 Not a day goes by that I don't see a dozen kids in the library in their baseball/softball uniforms or St. Louis Cardinals gear, and quite frequently they want books to read that support this interest. 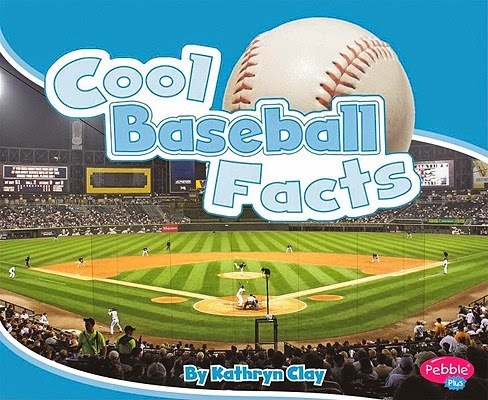 of a baseball field, a glossary, and an index. features called "The Coach's Corner," which share additional details. How does this all fit with the Common Core? For beginning readers, the CCSS emphasize reading informational texts appropriate for their grade level (CCSS.ELA-LITERACY.RI.1.10, CCSS.ELA-LITERACY.RI.2.10). That means the library having a batting order with non-fiction options at different levels of complexity, all of them heavy hitters that will engage and interest readers. 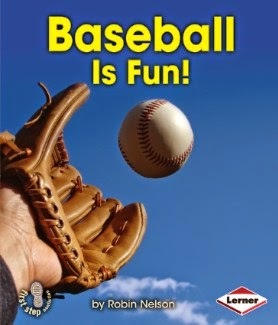 As beginning readers visit the library this spring and summer completely amped about baseball, we'll have plenty to offer. At the second annual School Library Journal Public Library Leadership Think Tank, which took place at the end of April in Nashville, the day-long professional development included a collaborative think tank session. All attendees broke into groups on a variety of topics of interest to public library youth services, and those groups brainstormed and discussed. I was facilitator and note-taker for the Savvy Tech Strategy group, and my excellent groupmates had plenty of thought-provoking ideas and perspectives to share. A recap of highlights follows. How do you build your technology toolkit? Collaborate with other institutions that have technology to share information and supplies. There's no need for everyone to buy the same databases, for instance, if they are already available through your state library. That's just one example of not unnecessarily duplicating tools. Ask a series of questions to inform what you add to your toolkit: 1) What do your users want? 2) What do your users need? 3) What do your users already have? Asking these questions can help ensure that you get resources that will be valued and useful to your service base. It helps, for example, to know if all your users have access to laptops already, because then you don't need to buy laptops. Make all resources seamlessly accessible. That means using tools that work together and complement one another instead of requiring multiple versions of a similar product for multiple platforms. Consider what you want to accomplish, and do that thing really well one way. Don't get bogged down in having three versions of a service--downloadable books, for instance--when having a single version will be simpler for users and staff. Give kids room to play. Don't hover over children using your tech supplies. Instead, let them explore how they work and use them in a way that feels natural to them. Dictating how to use a tech tool, or repeatedly saying things like "Be careful!" are going to serve as deterrents for kids who might otherwise use them. Provide options and variety. Not every kid wants to use laptops, and not every kid wants to do arduinos. 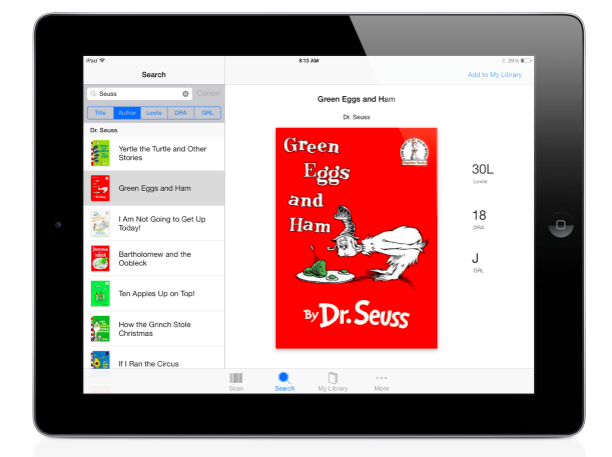 Have different tech tools available to suit the needs and interests of kids. Take the tech where kids are. That could mean bringing a cart of laptops to a public space, like a school football game, so that folks are aware you have them. It could mean traditional outreach opportunities. It also means having tech available in the parts of the library that kids already use. Offer what is immediately relevant to your users. A great example is in sharing electronic resources with kids: talking about SAT and ACT prep resources to seventh graders is going to be a dead end because kids that age don't care about college test prep. Make sure you're sharing appropriate tech. Use all the bells and whistles to draw attention. Everyone has seen a laptop, but MaKey MaKeys? That's attention-grabbing. Generate interest by showing how your tech is interesting. Know your community and their access issues, and provide accordingly. This is an extension of making it relevant, and it can go two ways: 1) provide tech tools that build on what kids already have access to; or 2) fill in the blanks with tech that kids aren't getting anywhere else. Those were our major takeaways of our Savvy Tech Strategy think thank session. The discussion certainly left me with many things to think about. For details on what the Makerspace think tank group discussed, you can see notes taken by Justin Hoenke here.